We spoke with Marks & Spencer’s Head of Sustainable Development Reporting Rowland Hill, to talk about the Plan A program, and what it really means to promise Zero Waste. Momina Sumbal: To start, what was the turning point or the moment that inspired the team to create Plan A? Rowland Hill: Plan A was first launched in 2007. It was the initiative of the new Chief Executive Officer at the time, who wanted to differentiate the business on the basis of sustainability performance. We wanted a modern sustainability program in the form of a long-term plan, with lengthy targets to ensure our goals would be meaningful. MS: Since the start of Plan A, what have been some of the biggest challenges you’ve faced in the process? RH: Generally I think it delivered what we wanted it to – it drove improvements to efficiency and innovation. But if you look back, one thing it could have done better is engage customers. Initially that was one thing we’d really hoped for – to define us in the eyes of shoppers. There are many fans of Plan A in the sustainability community, but it has had more limited impacts on actual consumers. 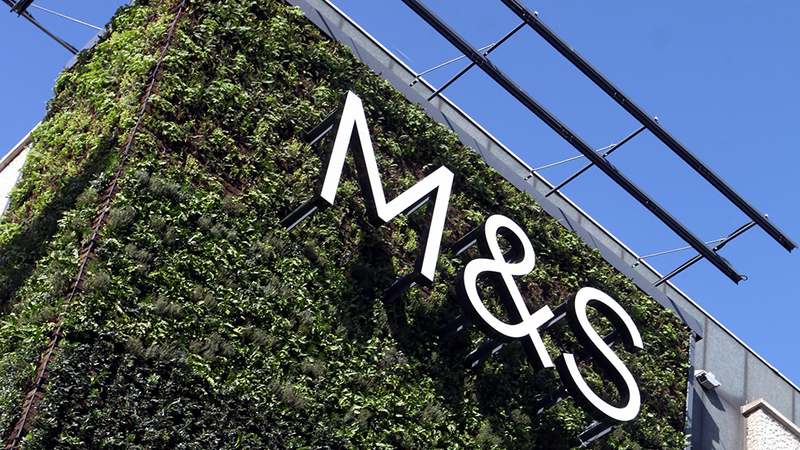 The Cheshire Oaks branch of Marks & Spencer in Cheshire, U.K., took seven years to build and was carefully designed to fall in line with M&S’s Plan A. It includes integrated birdhouses and a ceiling made out of timber mixed with recycled aluminum and glass bottles. MS: One of the major goals in Plan A is to become a Zero Waste business. As a multi-retailer operating in an industry where extreme consumerism is always a concern, can you speak to your efforts to champion sustainability in a climate of excessive consumption? RH: In the sustainability sphere we can fall into the trap of using language that isn’t accessible for the average consumer. For example, back in 2007 we had this notion of carbon neutrality, but people weren’t always sure what that meant. Eventually we got there, and with time, an understanding did develop around carbon neutrality. We want to frame Zero Waste with similar accessibility, with an approach that looks like a call to arms, and invites people to consume sustainably. I don’t think we can ever truly get to “zero”, but if we explain that Zero Waste is actually about making choices and reducing and phasing out materials that don’t have a second life, people will start to understand and get on board. Kate Heron: Nike is another company that frames lofty goals and absolute measures as obtainable. They call it a moonshot. The cynic in me looks at it as a way to almost remove responsibility if they never quite hit that target. But that’s an interesting way to reframe it, as a call to arms. RH: It absolutely is a call to arms – but you can only pull that one so many times. 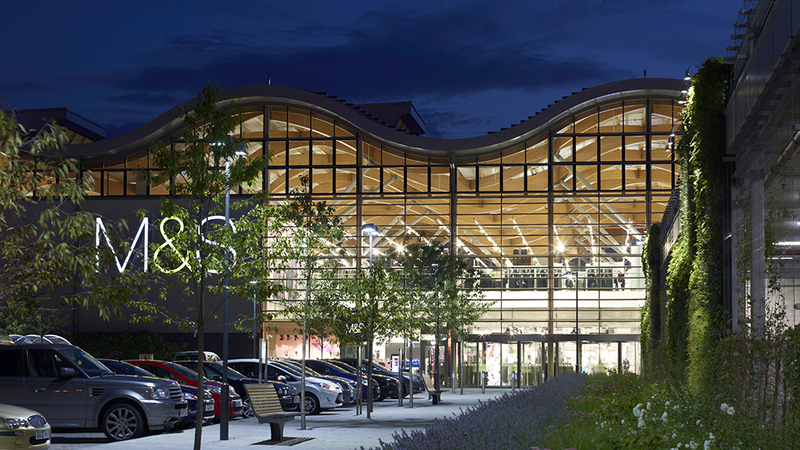 KH: The Marks & Spencer report is very forward thinking and integrates content and design exceptionally. What inspires a company or department to work closely with a design agency, to visualize complex concepts well? RH: I would say you have to have management support. You need that buy-in from leadership – whoever is calling the shots. They need to believe in the mission, and reflect that in how the company is organized. We actually think that a lot of what we do mitigates reputational risks, and even if customers don’t understand it, when there are other people that do, that creates value. The report is that one opportunity to impress stakeholders and make our content memorable. 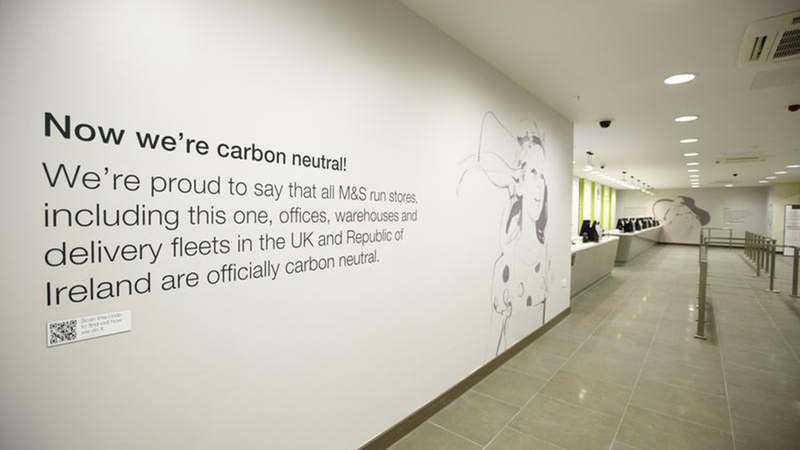 In 2012, Marks & Spencer became the very first retailer in the U.K. to become fully carbon neutral – five years after the launch of Plan A.
KH: My last question has to do with being a leading reporter. Does the team feel pressure because you’ve put out such a great document year after year? RH: There are some interesting pressures. Finding the balance between internal and external interests is key. You always want to maintain a reasonable level of sustainability performance – even if you’re not reporting on it – but if the priorities change in how you’re directed to report, you may find there were stakeholders who would have been interested in that information. You want to be accomplishing exciting things and achieving your targets, but at the same time, you don’t want your findings to come across as corporate vanity. That’s the trick. Learn more about what makes Plan A so successful in our latest edition of Sustainability Trends and Best Practices. 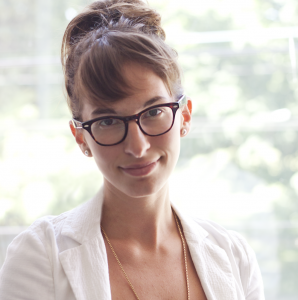 Kate is our Marketing Manager and has a knack for research, writing and Google Analytics. She is an ardent surfer, a New England Patriots fan and fosters Future Guide Dogs for the Lions Foundation of Canada. Find her on Twitter at @KateHeronWorks.